The Genealogue: What, No Zuzu? The "Z-Cox" family had a reunion Sunday in North Carolina. Note that, though just nine months old, Zeronald smartly went by the name "George" in 1900. 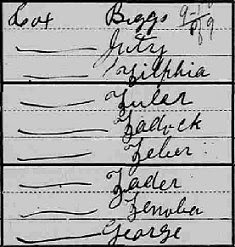 Careful analysis of census data (and of this 1910 photograph of the family) suggests that the couple probably did not marry in 1870, which was Jutry's year of birth, but in 1886.